A member of many professional and community service organizations including the National and Florida Associations of Criminal Defense Lawyers, Mark competed on the moot court national team, obtaining a partial scholarship, and currently serves on the board of directors of the Young Lawyers Section of the Dade County Bar Association, receiving national recognition for his work as chairman of the Schools Committee. 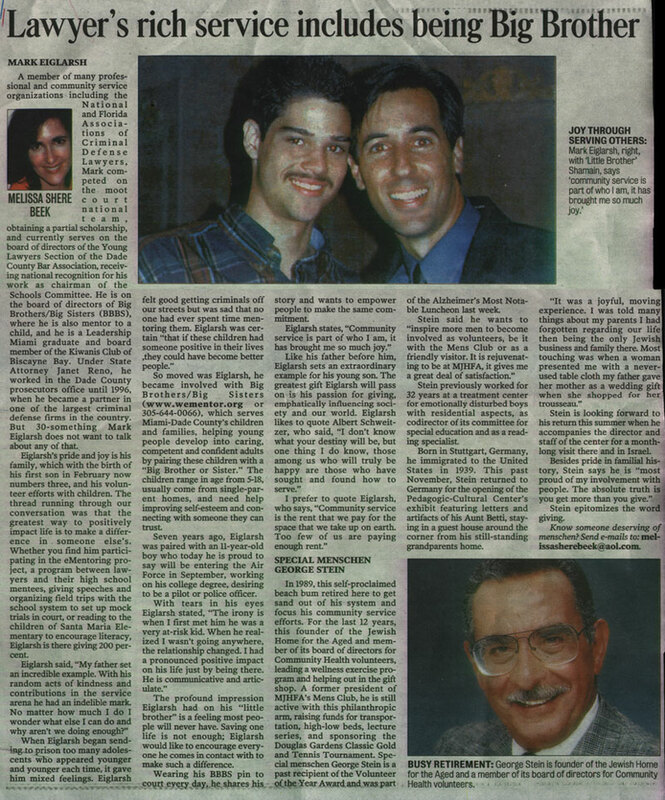 He is on the board of directors of Big Brothers/Big Sisters (BBBS), where he is also mentor to a child, and he is Leadership Miami graduate and board member of the Kiwanis Club of Biscayne Bay. Under State Attorney Janet Reno, he worked in the Dade County prosecutors office until 1996, when he became a partner in one of the largest criminal defense firms in the county. But 30-something Mark Eiglarsh does not want to talk about any of that.